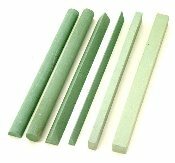 6 pc Green Silicone Sharpening Stone Set 6 different shapes 6" long. I'm not sure who makes these but these are great for getting into those hard to reach areas on tools. This item includes six sharpening sticks as pictured. I use a set of these in my shop for all my wood working tools.